Free Download Manager (FDM) is a completely free and full featured program to manage all your downloads. The program is able to detect and it starts automatically when you are about to download a file. Unlike the default download managers of internet browsers, this program is able to use parallel threads - this means that will split the file into multiple parts and will download them simultaneously, so you will download faster. This is useful for big files. FDM can be integrated as add-on for popular browsers and will allow you to download videos. It is highly customizable and you can enable or disable the monitoring per browser, import TXT lists with files and download them all, schedule the download activity or set time limits. 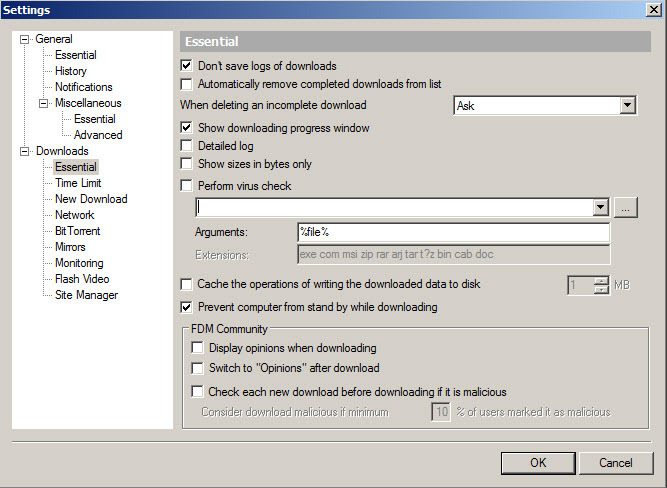 It supports torrents, you can select your antivirus program to be used to automatically scan the downloaded files, you can resume and restart downloads anytime. It is capable to recognize all popular protocols such as HTTP, HTTPS and FTP. Conclusion: A high quality program that works smoothly and gives you the freedom to customize its functions. Free Download Manager is available as free download for Windows 32-bit and 64-bit. Free Download Manager is 100% clean and safe to install. You can see the test results here.